Chandigarh, April 9 (IANS) Having remained inaccessible for nearly three weeks, Punjab Cabinet Minister Navjot Singh Sidhu is all set to don his chirpy avtaar from Wednesday when he will begin a non-stop 40-day campaign for the Congress across the country. Sidhu, who was reportedly sulking after being upset with the Congress leadership over not getting his due, is planning to hit the ground running. "The best way to discharge your duty is to dispense with it! Met Congress President @RahulGandhi Ji, he directed me to campaign extensively and meet @ahmedpatel Sahab for detailed schedule. Met @ahmedpatel Ji, campaign to begin from the 10th. Will be in line of duty for 40 days," Sidhu had tweeted on Sunday. On April 5, a deeply devout Sidhu had posted pictures of himself at the Shree Mata Vaishno Devi shrine in Jammu and Kashmir to seek blessings before hitting the campaign trail. Best known for his colourful one-liners, ability to talk non-stop, witty responses, chatty appearances on popular TV shows and cricketing events and even the colourful turbans, Sidhu can never be away from the limelight for long. His popularity as a campaigner can be gauged from the fact that at least 19 state Congress units had asked the party high command to send Sidhu for the poll campaign for the Lok Sabha elections. Sidhu was apparently upset after the Congress party overlooked his wife, Navjot Kaur, who was claiming the party ticket for the Lok Sabha election either from Chandigarh or Amritsar. Another grouse that Sidhu had was that he was not allowed to address a rally with Congress President Rahul Gandhi in Moga town in Punjab on March 7 as the ruling Congress launched its poll campaign in the state. Thirdly, Sidhu's name had not figured earlier in the list of star campaigners of the Congress. Campaigning aggressively for the Congress during the Assembly elections in Madhya Pradesh, Chhattisgarh and Rajasthan in November last year, Sidhu claimed that he had come to the brink of losing his voice. 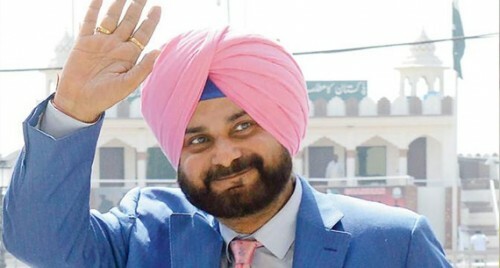 Having addressed over 70 back to back public meetings in these states - tearing apart the Bharatiya Janata Party (BJP) and its leadership with whom he was from 2004 till July 2016 - Sidhu was advised complete rest for five days in December last year after he injured his vocal chords during an intensive 17-day election campaign for the Congress candidates in the poll-bound states. During this period, (November-end, 2018) Sidhu also travelled to Pakistan for three days for the ground breaking ceremony of the Kartarpur Corridor with Pakistan Prime Minister Imran Khan. "The continuous helicopter and plane travel has been detrimental to his health because of him being on embolism (obstruction of an artery, typically by a clot of blood or an air bubble) treatment, he had suffered a DVT (Deep Vein Thrombosis) due to excess air travel some years ago. He has undergone a series of hematology (blood) tests which require sincere evaluation," his spokesperson had said in December. Following the advice from his doctors, Sidhu went to an "undisclosed location". The cricketer-turned-politician remained the BJP MP from Amritsar from 2004 to 2014 before falling out with the party (BJP) in July 2016. He joined the Congress in January 2017 just days ahead of the Assembly polls. During his stint as the Amritsar MP, "missing" posters of Sidhu were put up by his opponents on more than one occasion for his prolonged absence from the constituency and his inaccessibility to the local leadership and residents.